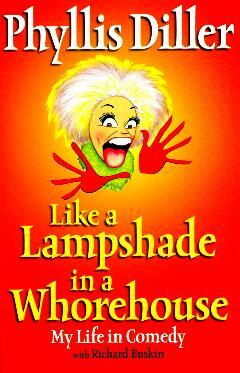 Weird title but it refers to something she wore and is typical of Ms. Phyllis Diller - quick and witty. Even though she's been around for more decades than she's like to mention, she doesn't seem to have missed a beat. This personal account of her life is a delight to read and covers her whole life, starting in Ohio and leading up to where she presently resides, in the Los Angeles area, and everything in between. An only child, Ms. Diller grew up learning to amuse herself and developing her creativity, playing the piano, and being funny. Perfectly candid about her two marriages (how she stuck them out I'll never know but I admire her gutsy determination), her five children, and how she started in show business. Huge fame and success didn't come early to this feisty lady (a lot of her comedy skits were based on bits of her home life), and her enviable attitude to life certainly has sustained her. Her cosmetic surgery was pioneering in her industry, and in my humble opinion, I think she is one of only two women I know of whose face-lifts were a complete success - she turned into a stunner. While her quirky looks were her trademark, and she used them favorably in her comedy routines, reviving and remodeling one's looks was a gamble - she definitely won, big time. I first saw Ms. Diller on television in the early sixties in Zambia and she made an enormous impression on me, especially her laugh. She's like a breath of fresh air, and still is. A positive outlook on life and one's career (instinct is also crucial) goes a long way to attaining success. Her artistic career includes being a standup comic, an accomplished piano soloist, comedy writing, actress, and painter. Astonishing! Conclusion - Loved her story and it offers many chuckles and smiles.